"These roasted root vegetables are colorful and delicious. More importantly, they can be partially prepared so as to ease the amount of preparation on turkey day. I often serve them with roast beef as well. The recipe can be easily scaled to suit a smaller yield." Place the rutabaga in a pan and cover with water. Add 1/4 teaspoon of salt. Bring to a boil, reduce heat to medium, cover, and simmer until tender and easily pierced with a fork, about 5 minutes. Drain well, and cool completely. Repeat steps to cook the parsnips and carrots. Place completely cooled vegetables in resealable freezer bags. Refrigerate for 1 to 2 days, or freeze up to 1 month. To thaw the vegetables, refrigerate overnight and drain. Pour the vegetable oil into a rimmed baking dish. Place the vegetables into a large mixing bowl and toss with the basil, salt, and pepper. Place the pan in preheated oven to heat for 5 minutes. Add the vegetables and toss to coat with the oil. Roast vegetables in preheated oven, turning every 10 minutes, until tender and golden brown, about 30 minutes. Sprinkle with parsley before serving. 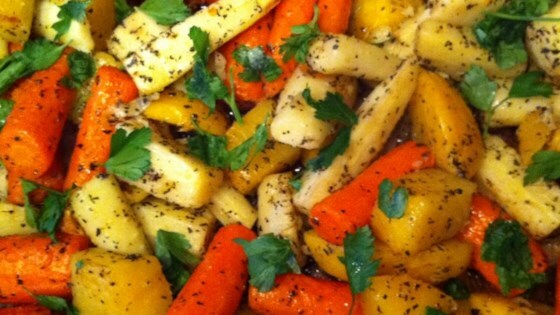 Learn how to roast seasoned root vegetables to bring out their earthy flavors. I scaled this back to 6 servings. The only thing I did not like was the basil flavor with these veggies. I will try this again, but maybe use some different spices to replace the basil. Glass baking dish is WAY better than a metal dish. Just tried it both ways. Never realized the importance of precooking them. You can easily adjust this recipe - quantity & type of root vegetables. Great side dish for a fall/winter meal.